If there is such an animal as a just war, then going to war against the unnecessary evil of hunger would qualify. 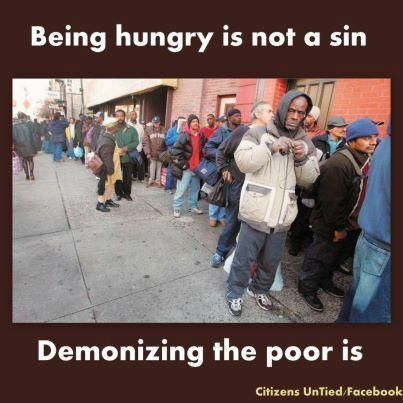 Allowing even one child to go to bed hungry is sinful. Business as usual when 13,000,000 kids go hungry in the richest, most blessed country in the history of the planet is just obscene. There’s nothing moral in that, and there’s certainly nothing Christian about it either. This entry was posted in Hunger & Poverty, News & Views, Quotes and tagged children, Christianity, hunger, Jeff Bridges, just war, morality, obscenity, poverty, quotes, sin, war, wealth on June 23, 2016 by Ray Buchanan. This entry was posted in Hunger & Poverty, Prayers, Spirituality & Religious Writings and tagged abundance, creation, death, God, grace, grave, hunger, Jesus Christ, new life, poverty, prayer, resurrection, sin on April 5, 2015 by Ray Buchanan. The article that follows is from the Huffington Post, and is another great example of a Church leader taking a powerful stand. It is decidedly refreshing, and a sign of hope that we have leaders who will call a spade a spade and who demonstrate leadership on critical issues of our time. Climate change and global warming impacts all of us. It is especially severe on those who have the least ability to mitigate its deadly effects. Those who intentionally turn a blind eye to climate change and its impacts on the poor and hungry are harming us all and helping destroy God’s perfect creation. And like the good bishop said, that is sin. Tuesday’s event kicked off a 30-day challenge for people to learn about and advocate for environmental change. Over the course of the initiative, which ends on Earth Day, April 22, participants who sign up on the Episcopal Church’s website will receive daily emails with information to help them reduce their carbon footprint and spread awareness about climate initiatives in their communities. Climate protection is an issue of personal interest for Jefferts Schori, who has a doctorate in oceanography and worked as a marine biologist before entering the priesthood in 1994. The bishop is a backpacker and nature lover who has studied interconnected systems like the circulation of water, the atmosphere and marine geology. In 2012 the church partnered with interfaith environmental nonprofit GreenFaith to launch a certification program for Episcopal churches around the country to make their worship and educational facilities more environmentally friendly. This entry was posted in Facts & Statistics, Hunger & Poverty, Quotes and tagged "life and death", blindness, climate change, enviroment, Episcopal Church, God, Greenfaith, hungry, imprisoned, Jefferts Scori, love, oceanography, planet, political interest, priesthood, sick, sin, species, war, water on March 28, 2015 by Ray Buchanan.